As we surpassed our five year anniversary, we reflected on all that we have been able to accomplish and on the things we have not been able to achieve. One of the main observations the kids made was that in virtually every audience we address, we get countless kids (and sometimes adults) who approach us excited at what they just learned but maybe just not as passionate about the same issues like animal conservation or environmental conservation that we are.But yet we still see a spark that we may have ignited which shows they too want to somehow make a difference. As we continue speaking with them we often learn that they infact have ideas of what they would like to be doing but just don’t know how to get started. That sparked Carter to come up with the idea that we should start a division which could help people follow their dreams and passion and show them simple ways to get things started. We’ve Got You Covered is a youth empowerment division that will allow youth to tell us their areas of interest and we will try and help them get started, even if it has something to do with an area we are currently not involved in. Today’s youth are extremely passionate and they have big hearts, we are just trying to give their passions a voice so they can show the world how much they too can make a difference. Both Carter and Olivia are a lot alike but they also have a few areas where they are different. For Carter, one of the areas he struggles with is understanding homelessness. Everytime we drive through parts of Atlanta which is ladened with homeless people, Carter struggles to understand and to find ways he can help. We often volunteer whenever we can at events that help feed the homeless or provide them with essential provisions etc. but for Carter, it’s still not enough so he decided to try and find a way he could help out. We managed to collect almost a thousand blankets from a local airline who no longer needed them which we wanted to share with homeless shelters. 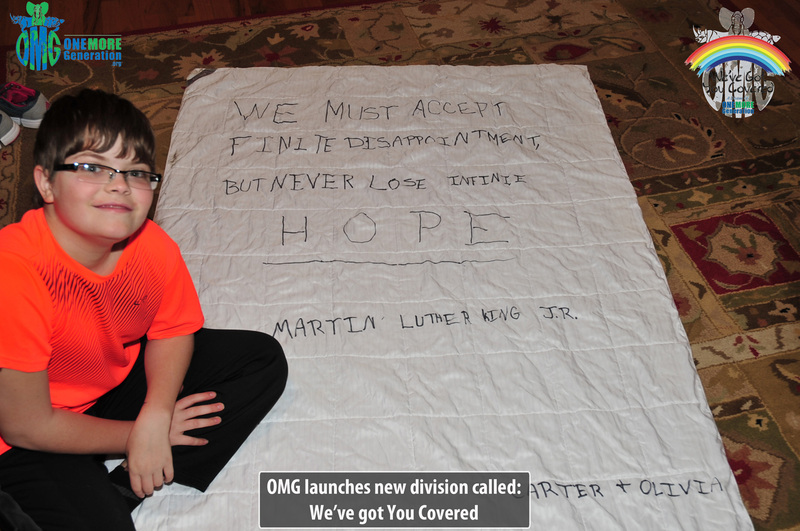 As Carter was doing his research, he came across the Children’s Restoration Network (CRN) of Atlanta which is responsible for 26 children’s shelters around the Atlanta area. That’s right, we have 26 children’s shelters in the greater Atlanta area. We had no idea. So Carter reached out to the director of CRN and set up a meeting. 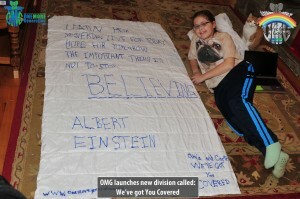 During the meeting it was decided we would support the efforts of the CRN by donating the blankets. 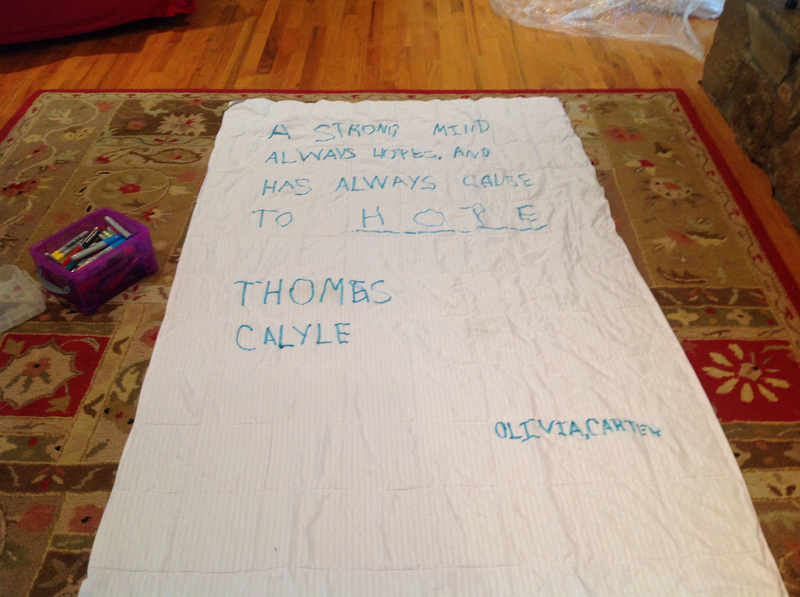 After picking up and inspecting the blankets, Olivia suggested that we write inspirational quotes on each blanket before handing them out so that the recipients know that they are cared for and that there is light at the end of the tunnel. The director of CRN liked the idea so much, he has agreed that we could actually host a blanket decorating party at a few of his shelters where we can get the children involved in the art project. 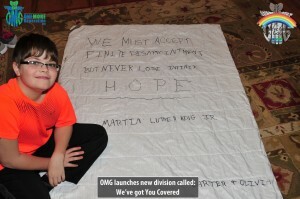 We are now in the process of scheduling our first decorating party and delivery of the blankets. We are confident the children will all enjoy the event and receiving the blankets. If you are interested in helping out at one of the events, or if you would like to make a donation of materials or funds to support the CRN, please let us know and we will share all the details. We’ve Got You Covered is designed to ignite a spark in youth everywhere and to help them find ways they too can get involved in what moves them to make a difference. Stay tuned to more exciting news about other events we will be hosting in the future and if you too would like to get involved, please drop us a line at info@onemoregeneration.org and we will help you out.